Unpleasant conditions and crazy hours can't deter nature photographers who do what they do for love of the outdoors. 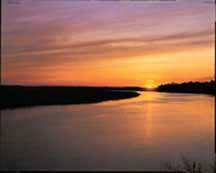 South Carolina Wildlife photographer Phillip Jones has seen a lot of sunrises. Employed in a career that often requires him to be sweating in the woods or knee-deep in frigid swamp water well before most of us even think about waking up, Jones could be excused for being a little jaded about nature's simple pleasures. But those simple pleasures are just what keep him going. 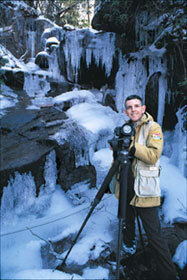 Jones waxes poetic when asked what first attracted him to nature photography. "I've never seen a sunrise that wasn't beautiful," he says, "even the one after Hugo." He has a vivid memory of the devastation following the hurricane that laid waste to the South Carolina coast in September 1989. "It looked like the end of the earth," he says. "Boats were piled up on one another, all the houses were destroyed, and everything was just . . . gone." But amidst all that destruction was a reassuring sign: the sun rising yet again on a brand new day. That particular sunrise, which Jones witnessed from a National Guard helicopter surveying the damage, was a stunning magenta-tinged miracle that he remembers to this day. Every nature photographer - professional or amateur - seems to share Jones' sense of wonder in images that many of us take for granted. They also share his boundless enthusiasm. Whether he's discussing camera techniques for catching lightning, his recent early-morning turkey outing, or a year-long project on the life cycle of monarch butterflies, Jones can barely conceal his passion for taking pictures. It's that enthusiasm, coupled with a love of nature, that drives people to pursue nature photography as a career or simply as an all-consuming hobby. Whether photographers make their living capturing astonishing images in the wild or pursue nature photography as a pastime, it comes with its own set of rewards and frustrations. It also takes a special kind of person. 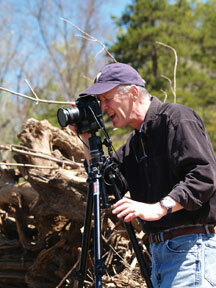 According to Doug Gardner, owner of Totally Outdoors Publishing, all nature photographers have one thing in common. "We're all a little nuts," Gardner admits. Gardner doesn't seem crazy, but listening to him describe his job makes one wonder if he might be onto something. "It's a tough living," he says understatedly. Not only do professional nature photographers have to keep up-to-date on constantly changing equipment but the job also comes with bad hours, to say the least. Gardner describes a typical day in the field as "getting up at four thirty in the morning when it's eighteen degrees outside and wading through a frozen swamp to sit for three hours." Sometimes the job can get downright harrowing. Michael Foster, photographer for South Carolina Wildlife magazine and the S.C. Department of Natural Resources, recalls being lowered onto the top of Table Rock from a helicopter to get shots of a peregrine falcon-release project. 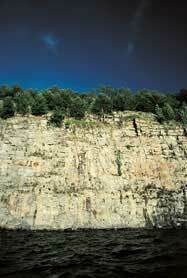 When the pilot instructed him to jump out, Foster did just that and found himself "hugging the rock and looking straight down" at the valley below. This particular shoot was one of Foster's first, hardly a gentle welcome to the job. Adding to the frustration is the fact that good pictures - those that give us an intimate glimpse of the wildlife that most people never see - are hard to come by, even under the best conditions. For every great shot, photographers spend hours in the field and shoot countless rolls of film or digital pictures. It takes more than a camera and the discipline to get up early to get good photographs. Like any artist, a nature photographer must command a great deal of knowledge about his subject matter. Gardner, who grew up hunting, believes that any good nature photographer needs a hunter's instincts and knowledge of pursuing game to be successful. While it takes dedication, determination and skill to capture high-quality images, good fortune plays a role as well. "Luck is the thing," says Jones, who was once hunkered down in a blind when a deer almost ran into him. The photograph that Jones snapped that day depicts the buck seeming to look the viewer in the eye just before it bolts away. The iconic picture, titled "Your Move," has become Jones' signature print. Still, good pictures are not the product of blind luck alone. Nature photographers need to develop a knack for being in the right place at the right time. "It's like the old saying," Foster explains. "Chance favors the prepared mind." Photographers have to know how and when to put themselves in a position to benefit from a stroke of luck. While nature photography can be a frustrating career, it's one to which professionals like Foster, Jones and Gardner seem uniquely fitted. "If I didn't have to work tomorrow," Jones says, "I'd probably be somewhere taking pictures of something." Gardner, who collected Coke bottles as a child to buy film with the deposit money, agrees. He's been taking pictures since his mother gave him a Kodak box camera when he was eight years old. "I'd shoot everything," he laughs, "bubblegum on the sidewalk, the dog, birds in the back yard." Luckily, Gardner was able to find an outlet for that creative streak that combined his two great loves - photography and the outdoors. In addition to conducting workshops where novices can learn everything from camera settings to how to build their own photography blinds in the wilderness, Gardner makes his living as a full-time nature photographer. His book The Nature of Wildlife is full of stunning wildlife photos taken right here in South Carolina and around the world. With the advent of digital-camera technology, it's becoming easier for amateurs to produce captivating images, as well. This ever-growing pool of amateur photographers can sometimes be trouble for professionals. "Every retired doctor and lawyer is out there with better equipment than I have," Jones laments good-naturedly, "and they want to give their pictures away." At the end of the day, Jones and many other professional nature photographers don't seem too upset that more and more amateur photographers are venturing out into the woods. If anything, he finds it satisfying that so many people are finding pleasure in what he loves doing. It's easy to see why nature photography is a rapidly growing hobby. Robert Kemmerlin, an amateur photographer who serves as a regional chair of the Carolinas' Nature Photographers Association, says, "a bad day in the field is better than a good day at the office," and notes that he loves nature photography simply because he gets to watch animals "doing what they do." Nature photography provides an excuse to get out and enjoy the wild, and it's a way of taking something home without disturbing nature. For many, taking pictures is a way of appreciating nature more fully. "I just love to be out there," says Ron Ahle, a DNR biologist and amateur photographer, "and taking pictures of nature heightens your awareness of it." That heightened awareness of nature sometimes allows photographers to get better shots. 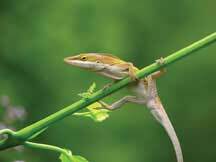 Through careful observation, Lisel Powell, a two-time South Carolina Wildlife photography contest winner, learned how to get better shots of male anole lizards displaying their characteristic red dewlaps to attract mates. By watching the lizards, she noticed that they bob their heads just before showing off for the females. Picking up on that behavioral tic allowed her to snap pictures at just the right moment, making for some impressive shots of the display at its peak. Kemmerlin, too, has an eye for detail that has led to better pictures of birds poised to erupt into flight. "If a bird relieves itself," Kemmerlin chuckles, "it's getting ready to take off." With seven regional chapters and more than six hundred members, the Carolinas' Nature Photographers Association is the largest organization of nature photographers in the country. It's also the perfect place both for beginners and experienced photographers to find others who share a passion for taking pictures of nature. The CNPA conducts photography outings and arranges workshops where enthusiasts can gather to learn more about all aspects of nature photography. Lisel Powell, a CNPA member, says her involvement with the CNPA has sharpened her photography skills and keeps her informed about new camera techniques, which is increasingly important with the dawn of digital technology. Perhaps even more important than the educational aspect of the CNPA is the fellowship it provides. "Having friends to go shooting with is what keeps my interest up," Powell says. "Photography would not be as fun for me if I always had to go out on my own." The CNPA is growing rapidly. Yearly membership dues are $45, with special rates for senior citizens, students and families. Membership information is available at the organization's Web site, www.CNPA.org. The Web site also offers galleries where members display their work, and the group has plans for an expanded Web site, featuring forums in which members can discuss nature photography and list camera equipment for sale. Powell didn't need that particular piece of knowledge to take her latest award-winning photograph, which earned her Best in Show in the 2007 S.C. Wildlife photography competition. The picture captures a cedar waxwing balancing a berry on its tongue. Powell had for years wished to photograph waxwings, but had never been lucky enough to see them as they passed through her hometown of Aiken during their yearly migration. Then she happened to see a group of them in a tree while she was on the way to a work meeting. Fortunately, the birds were still there when she returned with a camera after the meeting. Although she was able to get some good shots that day, Powell went out hunting waxwings almost every day for a week. On the third day of her "hunt," Powell found a group of waxwings flitting about some trees near a strip mall. When she later reviewed the photos from that morning, Powell was "pleasantly surprised" to see that she'd been able to capture the split-second balancing act she'd seen the birds perform. The image Powell caught on film is alluring, saturated in muted morning light and seeming to catch the bird in a candid moment. Producing captivating images like that one is a big part of what drives many photographers. Ahle, who finds "a lot of art in nature," says that it's sometimes possible to "create an image that's even better than what you saw" in the field because a good picture is about "composition and motion." While all photographers are looking for that perfect image, part of the allure of nature photography for most amateurs is capturing experience, as well. Kemmerlin displays many of his pictures in his office, where they provide welcome relief from the frustrations of work. "I can look at a picture and think about how much fun it was to take it," he says. "I've got thousands of pictures and a story for every one of them." Whether combined with the desire to capture a moment or the urge to produce a great image, all nature photographers, professional and amateur alike, find motivation in their love of the outdoors. Taking pictures allows them to share that love with others. Perhaps Phillip Jones sums it up best when he says, "I just get a kick out of knowing that other people are going to get to see what I saw." Joey R. Poole lives in Florence and makes his living as an English instructor and free-lance writer.